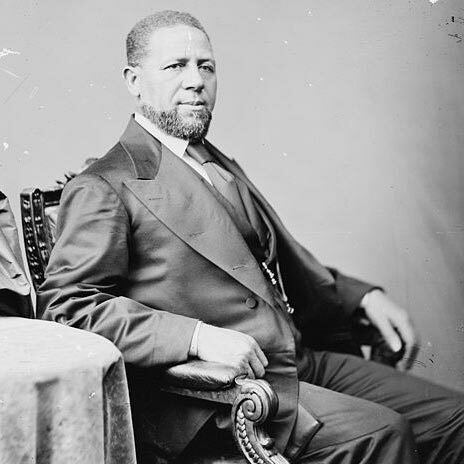 September 27, 1827 Hiram Rhodes Revels, the first African American to serve in the United States Senate, was born in Fayetteville, North Carolina. Revels was ordained an African Methodist Episcopal minister in 1845 and in 1846 he was given a pastorship in Natchez, Mississippi. Revels was elected an Alderman in Natchez in 1868 and elected to the Mississippi State Senate in 1869. At that time the state legislature elected U. S. Senators and Revels was elected to finish the term of one of the state’s seats left vacant since the Civil War. On February 25, 1870, he took the seat in the U. S. Senate where he served until he resigned on March 3, 1871, two months before the end of his term, to become the first president of Alcorn Agricultural and Mechanical College (Alcorn State University) where he served until his retirement in 1882. Revels died on January 16, 1901.